I have thought about reviving my food polls a few times before, mainly because I thought it was so fun for me and I found out a lot of things people thought about food. But I recently had something propel me to actually do it rather than think about it. I had a great snack and celebrated it by tweeting! And I love that I had friends who immediately tweeted back. I just had a really yummy apple for my snack…. dang it was good! It was an awesome apple…. a Granny Smith apple actually. It was really crisp. It was a bit sweet and a bit tart. But since I had so many folks get involved in sharing the love of apples, I thought I’d find out what the in apple is! This poll is for eating the apple fresh — I realize cooked apples may be different! Now that I have you thinking about apples, how do you like to eat them? 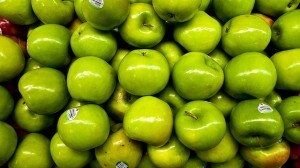 What’s you favorite apple food? Feel free to add your favorite way in the poll and if you have a recipe that you think will wow people, put that in the comments! There are apple farmers in a lot of places. In fact, my mom has some cousins in Tennessee who have an apple orchard. They are kind of distant cousins so I’ve only visited once as a kid but we grew up having an apple tree in our backyard and I’ve seen them in lots of states as you drive around. One of my agnerd friends, Jeff VanderWerff in the Grand Rapids, Michigan area has a family farm that grows apples for commercial production. He’s done a series of videos that are on YouTube that let you see how they plant a new apple orchard, how they deal with pests, and more. I thought this video about understanding whether frost hurt blooms is a good one cause this spring hasn’t gone too smoothly! Some of you may already remember I’ve talked about my friend Ben LaCross of northern Michigan being a cherry farmer, well his family has apple orchards too! He did a great Q&A with the Supermarket Guru about his family farm and mentions that they sell through farmstands locally as well as providing things wholesale. I love this video Ben did showing how they handled harvest in 2010 and talking about what’s important in that process. What other foods do you think should make the series? I already have some ideas on food polls but you know I’m always open for suggestions! What kinds of food questions do you think I should be asking? Let me know by putting it in the comments! Also give me your other thoughts on apples! Can Food Dictators and Food Choices Co-Exist? « Left Wordless By Visiting a Flower Farm — Lots of Irises & Peonies! You know what’s bad? My daughters LOVE honey crisp apples, but they are costing me $3.50 a POUND right now. It’s crazy. Hmmmm…. Last spring we had a late frost. I remember visiting Ben’s farm and there were like almost no blooms. Wonder if that is what caused prices to get so high? Demand is still there but frost cut supply a lot? Maybe Jeff or Ben will weigh in. Thanks a bunch Jennifer! I’ll have to look for Mutsus! And thanks for the video link too! I think one of your food polls should be what new food have you tried that you love OR what is a food you would like to try but haven’t had to courage to yet – something along those lines… You could also do favorite summer food or dig into the huge food trend of BACON!